Thanks for taking the time to consider our villa. We hope that you find everything you are looking for. If we are fortunate enough to receive your reservation, you can choose to reserve online or through us directly. Please note that if you choose to reserve online that we request all rentals start and end on a Saturday. Please contact us directly for any reservations outside this time frame. Special rates are now in effect. We have adjusted our rates to reflect the current economic conditions. Compare our villa with those priced between $99 - $140 / Night. Thank you for your interest in our villa. We have provided a breakdown of the different rooms in the villa so that you may more accurately determine whether it meets your needs. We hope that you find everything that you are looking for. You deserve a holiday that is close to the action yet provides a quiet retreat away from all the commotion. Our villa is located in the subdivision of Westbury in Davenport. It is a 10-minute drive to the gates of Disney, yet surrounded on one side by orange groves. Whether you choose to relax by the pool, take in some golf or visit the many different attractions, this villa is perfectly situated for it all. Upon entering the villa you will find an inviting family room with comfortable sofas and a large flat screen HDTV. The perfect place to unwind after a day out. Watch TV with Netflix or over 200 channels to choose from or, slip in a DVD and watch a movie. Alternately, turn on the stereo, relax and enjoy the conversation. The kitchen is fully equipped with plates, utensils, cooking pots, fridge, stove, microwave, dishwasher and more. The open concept allows you to be part of the group whether they are in the family room or dining room. If you’re planning to keep in touch with someone from Canada, United States, Mexico, Puerto Rico, Guam or The Virgin Islands, you can do so with unlimited free calling. The dining area has full seating for six people, with a window overlooking the pool. It's ideal for taking a break from the sun while keeping an eye on the children. Adjacent to the dining area are 'alarmed' patio doors giving direct access to the pool and deck area. This is a room to retire for peace and tranquillity. You will have a heavenly sleep on the king size bed with ultra plush pillow top. Adjoining this room is your 3 piece bath with a large luxurious tiled shower. You have your own separate entrance to the pool for those late night dips. As well, you can relax with your own personal TV until it’s time to enjoy a restful sleep. Keep all of your clothes nicely organized in the walk-in closet. Another lovely master bedroom down the hall awaits you. This bedroom has its own colour TV and three-piece bath featuring the oversized tiled shower. A lovely queen bed awaits the tired traveller. A great room for the kids. You’ll find a colour TV with an X Box One game console ready to keep the kids busy for hours and allowing the adults some peace and quiet. When it’s time for sleeping, you’ll find two twin beds ready and waiting. Another great room for the kids featuring two twin beds. A fold out full bed from the sofa allows you to sleep ten people in the villa. The third bathroom is adjacent to the two twin bedrooms. In there you will find a 4-piece bath for the family. Want more things to do? Well, head towards the games room! There you’ll find a pool table, foosball table, air hockey table and dart board. Guaranteed fun and enjoyment for the whole family. It just wouldn’t be Florida holiday without your own south-westerly facing, private pool. The oversized pool measuring 28' X 14', has ample sun loungers for lazy days by the pool, and a table with chairs for 'al-fresco' eating, the pool area is fully screened to keep out bugs and insects without blocking out the Floridian sunshine. The villa backs onto a small conservation area. A great place to relax, but bring your laptop to keep yourself up to date. Wireless internet is available throughout the villa. Even on holidays, there comes a time to keep up with the laundry. The villa is well equipped with a washer, dryer, ironing board and vacuum cleaner. Carol is a school teacher and Bernie is an airline pilot. We have three lovely children who keep us very busy. We chose our villa for it's location to Disney. We love the Florida weather and all the attractions nearby. Our villa is South West facing which is very important. This ensures that you receive maximum sun time, in the pool area, during the winter months. In addition, we do not have villas behind us so you are not constantly looking at other guests all the time. We have made this our home away from home and have included all the amenities that we would want if we were renting. Hope you enjoy your holiday. All bed sheets and pillows. All bath, face and hand towels. Dish towels. All dishes, glasses, cutlery, pots and pans to serve 10 people. Staples such as sugar and spices, laundry and dish detergent are not supplied. 51 Inch Flat Screen, 40 inch, 36 and 2 X 32 inch flat screen TVs. All bedrooms have flat screen TVs. South-west facing pool that keeps you in the sun longer. Our family of six stayed here for a quick Legoland visit. Property was clean and well maintained. Owner called to make sure everything was in order. Beds were comfortable. Pool was still chilly but kids loved it any way. We will be back! We appreciate you providing such a nice review and pointing out how our villa is close to Legoland. We just want to point out that the pool was chilly as pool heat was not requested. Clean, tidy and comfortable, I would recommend this property. We really appreciate the review and look forward to hearing from you again. Everything was perfect. The house very confortable, fully equiped, great location. The owners always available for any doubt or request we might have. 100% recommendable! Wow! What a great review. We really are happy to hear you enjoyed the villa and had a great vacation. This home was PERFECT for our surprise Disney vacation! We stayed in many of these types of rentals but this unit surpassed all our previous experiences. This home has everything you need for a comfortable stay. The kitchen had plenty of dishes and cooking utensils. The beds were very comfy! Perfect after our long days at the parks. We had fun playing games as a family as well as playing pool and darts in the game room. 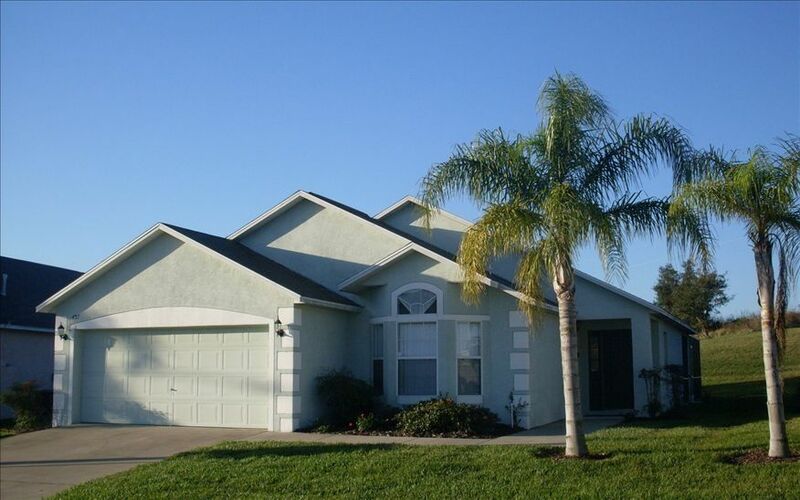 This home is located in a nice neighborhood close to all the parks with shopping just right down the road. All the information we needed for maintenance, Wi-Fi, etc. was posted throughout the home, which was great! The pool was a great plus! This home was literally perfect and we will definitely try to book again when we go back to visit. Thank you so much Bernie and Carol! Talk about PERFECT. That was a perfect review and is greatly appreciated. You nailed all the points that we hope to deliver on and are so happy that you enjoyed your stay. Thanks again for such a great review. This is the best Florida villa we have stayed in, it is very well looked after and equipped, the rooms are spacious and comfortable, lovely pool, quiet location but quickly accessible for all the parks and restaurants. We loved it and will definitely be back. Great communication with the owners and management company too. This is the type of review that every owner dreams of. It lets us know that we are doing a good job and that the people we hire are also doing what we expect. More importantly, you had a great vacation and that is something we truly wish for all our guests. Thanks for choosing our villa. We look forward to your return. The VRBO/HOMEAWAY website does not allow for pool heat to be added on an optional basis. Pool heat is an additional $20/night plus 10% tax. If we are fortunate enough to receive a reservation request from you and you desire pool heat; kindly mention this in the remarks. We will edit the reservation to include pool heat and you will be sent a new quotation. Preference giving to weekly stays or greater starting on Saturdays. Christmas Reservations must be a minimum of two weeks. Add $80 cleaning fee for stays less than 7 days.